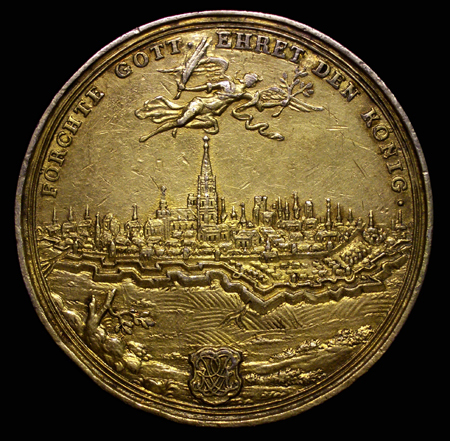 City of Strasbourg Silver (gilt) Medal with City Coat of Arms and Ten Arms of the Cities of the Dekapolis. 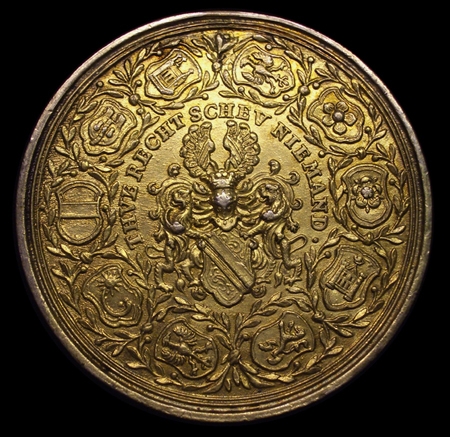 This beautiful medal, possibly minted some time between 1655 and 1678, depicts two lions on the obverse that hold the behelmte stadtwappen (the city's coat of arms with a helmet). The coat of arms is encircled by the arms of the 10 cities of the Dekapolis. On the reverse is the city of Strasbourg with an angel flying above holding palms in one hand and an olive branch in the other. Founded and ratified by Charles IV in 1354, the Dekapolis was an alliance of ten cities in the Alsace region of the Holy Roman Empire with the city of Haguenau as its capital. Alsace is a region on the French and German border that has been an area of dispute between the two nations. The Dekapolis included the cities cities of Münster, Kaysersberg, Türkheim, Colmar, Schlettstadt, Landau, Weissenburg, Rosheim, Hagenau and Oberehnheim. Strasbourg remained an independant city though its concerns and fate mirrored the cities of the Dekapolis. The cities were annexed to King Louis XIV of France by the Treaties of Nijmegen in 1679. The alliance would be dissolved and the city of Strasbourg would be seized by the French King in September of 1681.